Our friends and family know that Chris and I are creatures of habit. We like routine. For us, it's not a "rut," as these routines often are things we look forward to each week, like getting Tex-Mex, eating at Chipotle before getting groceries on Saturday afternoon and having a midweek glass of wine (or cocktail) on Wednesdays. 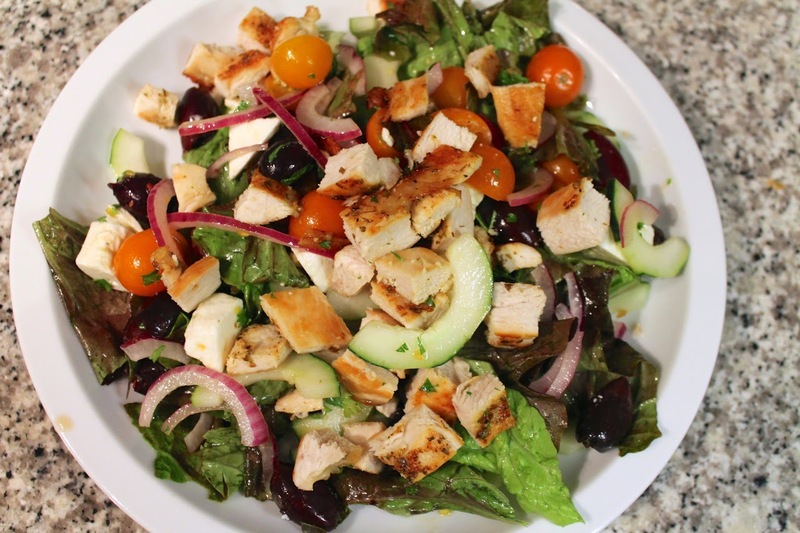 For years, we've made Tuesday "salad night," a move to make one of our weekly meals loaded with fresh vegetables and low in carbohydrates. Since I started my blog a couple years ago, having new content to write about has meant that we don't repeat meals nearly as often as we used to. I'm almost always trying to come up with new salads for Tuesday nights, which has made salad a regular recipe item on my site. But Before Cook In / Dine Out, on Tuesdays we usually ate Greek Salad, or some sort of derivative thereof. There's a bit of debate as to what constitutes Greek Salad. Traditionally, it doesn't have lettuce, but it's common to find lettuce in the United States and other countries. 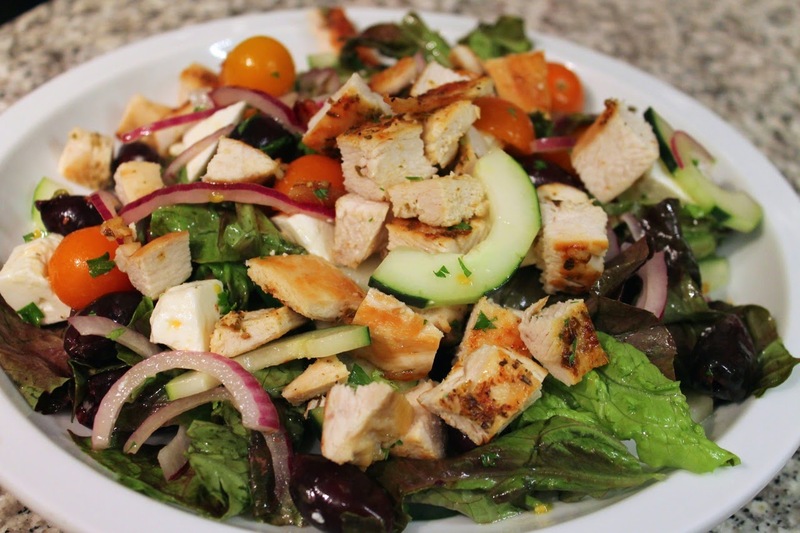 Since I made Greek Salad as an entree salad, I include lettuce, and I also like to include sautéed chicken. Tomatoes, kalamata olives and cucumber are definitely essential, as is feta cheese. If you can find imported Greek feta, I recommend that over domestic American versions. I don't always include onion, but some thinly sliced red onion is good, especially if you soak them in ice water for about 10 minutes to reduce their bite. Bell peppers are optional, as is a garnish of a pickled peperoncini. What I don't think belongs in Greek salad is bread. This isn't fattoush, so no pitas; nor is it panzanella, so no toasted croutons. This is a salad where the vegetables should get the glory. 1. Fill a medium bowl with ice water. Add the sliced onions and set aside for 10-12 minutes. Drain the onions and add to a large bowl. 2. Heat olive oil in a medium frying pan over medium heat. When hot, add chicken, season with salt, pepper, garlic powder, oregano and chili pepper flakes. 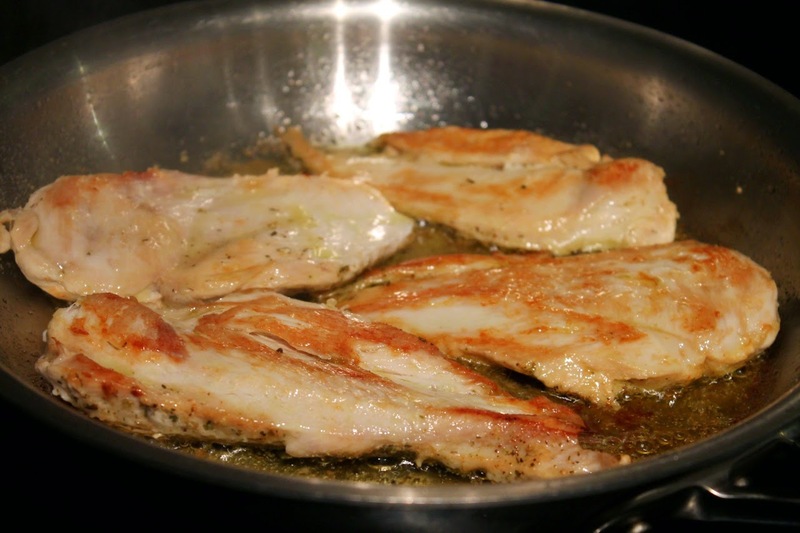 Cook until lightly browned and cooked through, about 10 minutes, turning halfway. Set aside to cool, then chop into 1-inch pieces. 3. To the large bowl with the onion, add the lettuce, cucumber, tomatoes, olives, feta cheese and parsley. Whisk together the dressing ingredients and pour over the salad. Toss to combine. Serve on plates topped with the chicken.